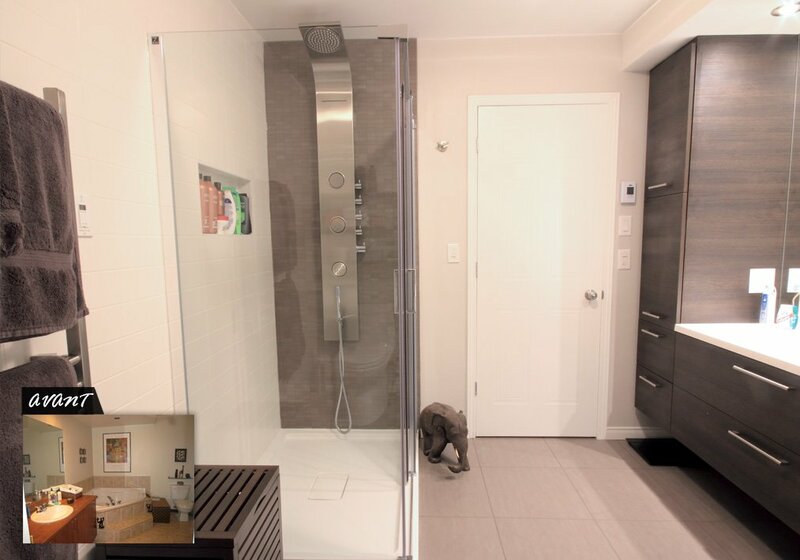 Discover this superb bathroom renovation project in a Rosemont residence. You too can benefit from our expertise as a general contractor specializing in bathroom renovations and our turnkey renovation services. Call us for a free consultation! If you have owned your home for several years, it is normal that your needs and tastes change; that you want to transform your bathroom into a more modern and practical haven of peace. These Rosemont customers have decided to transform their bathroom completely to give it a more contemporary style and to make it more adapted to their needs. With our design team and the ideas of our clients, we have designed a renovation project that lives up to their dreams! Before we start the renovation, we have a huge demolition task to complete. We removed and disposed of the large corner bathtub, shower, vanity, cabinets, and floor. We also carried out remodelling work on the plumbing to accommodate the new shower facilities. For more prestige, our customers have chosen a grey ceramic tile floor covering themselves. They then opted for a custom suspended vanity with dark grey melamine cabinets and drawers, with a porcelain countertop. Overhung by a mirror, the vanity also includes a sink and a stainless steel fitting. As a general contractor specialized in bathroom renovation, we take care of all the steps of your project: design, 3D drawing, demolition, construction, renovation, etc. To do this, Construction Précellence has established partnerships with flooring specialists, cabinet and bathroom countertop manufacturers, electricians and heating and ventilation specialists to make this project a success across the board. If you would like to have more information about the Rosemont bathroom renovation project, our turnkey bathroom renovation service, or our prices, please do not hesitate to contact us by email or phone. Your first consultation is free of charge! Our team will be pleased to welcome you and answer all your questions.